In addition to her other experiments, Courtney has completed several predation assays. A predation assay is an experiment designed to get an understanding of the predation rate in a habitat. In other words, what and how much is being consumed in an area. BBQ skewer with fishing line. Either a pipe cleaner, amphipod, or romaine lettuce is attached to each skewer. Courtney preparing the skewer samples. Courtney's data sheet. F for fuzzy or fake (pipe cleaner), D for sun-dried amphipod, or H for herbivory (romaine lettuce). 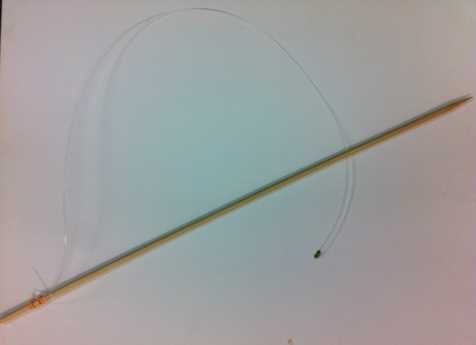 Courtney makes tethers using bbq skewers and fishing line, where she either glues a piece of brown pipe-cleaner, a sun-dried amphipod, or attaches a clothes pin with a 1in x 2in piece of romaine lettuce. Courtney makes 10 skewers of each (pipe cleaner, amphipod, romaine lettuce), making a total of 30 skewers. Each skewer is placed at 3 tidal heights (low intertidal, mid intertidal, and marsh). 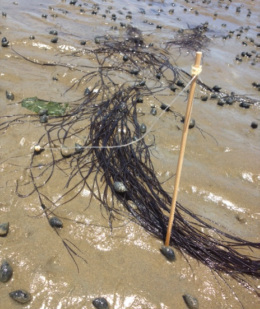 The skewers are placed out in the field when the tide is low enough to expose them. The skewers are left out in the mudflat for 24 hours. After 24 hours, Courtney checks on her samples. She measures how much of the original is remaining in quarter increments so 0, 0.25, 0.5, 0.75, or 1. 5. Data is recorded on a data sheet, and later turned into a graph to see how predation rate has changed over time. Courtney wanted to get an idea of predation rate on amphipods as it changes throughout the months and how herbivore rate changes during the summer months. This experiment tests the hypothesis: As temperature rises, there will be an increase in predation. Courtney wanted to see if this hypothesis held true on the mudflat she works on. The experiment also answers the questions, "Are amphipods being eaten at different amounts during the year?" and "Does that rate agree with the abundance of predators in the marsh, as well as the abundance of amphipods she collects from Gracilaria?" The amount remaining of each type (fake, dried amphipod, and herbivory) were averaged for all tidal heights. All three tidal heights show the same thing. The predation rate of the fake pipe cleaners stays at 1, meaning that no predators were eating them. The herbivory rate didn't show much of a change either. The amphipods predation rate did show significant change over time. Below are the results of amphipods consumed on the mudflat from July 2013 to August 2014. Predation rate of amphipods increases in the summer months, and decreases in the winter months. Why might that be?